Every cyclist dreams of paddling on smooth metallic roads, which passes through the picturesque valley, eye soothing landscapes and dramatic and peaceful countrysides. Well, such places do exist in real life and that too in India. If you have a dream of cycling on such beautiful places, then you should go for a Cycling Tours East India, propounded by Tour My India. This tour will take you to the best holiday destinations in North-Western Sikkim regions. The beauty of the countryside, flora and fauna and lifestyle of the Sikkimese people is best experienced on a bike's seat as you meander through lush green hills and dales. Starting and even ending at Gangtok, the cycling tour will take you to some of the remotest regions of Sikkim like Phedang, Singhik, Chungthang, Lachung, Yumthang, Lachen, Thangu, Rangrang, and Kabi. The winding and at times narrow trails cut through the meadows dotted with gushing waterfall and wildflowers, which are further flanked by towering mountains. During the journey, you will see silver fir trees, and cherry red Rhododendron eloped in clouds and snow white Magnolia further adorns the cycling trail. 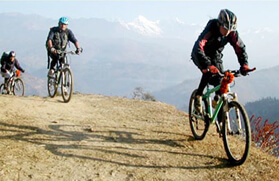 There is no better way to explore Sikkim than by a cycling. 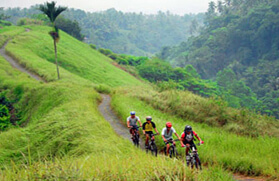 And there is better cycling tour than the one, which is mentioned below. Upon arrival at Bagdogra, you will be embarking on a 123 km drive to Gangtok. Our representatives will meet you at Gangtok, to transfer you to a hotel for dinner and overnight stay. Today is going to be the first day of your cycling expedition. During today's cycling journey, you will come across Tashi View Point, from where you can see the panoramic view of Mt Kanchenjunga and its neighbouring mountain range. Further, you will paddle through the Sikkimese villages and then cross Teesta river to reach Phedang for overnight stay and dinner. Eat healthy breakfast, speed up your bike and make way towards Singhik. Today, you will be passing through Lepcha villages and many other remote villages of Sikkim. Till Mangan, it's going to be an easy ride. But after that, the trail get little bumpy, and you will start following Teesta river to reach Singhik for overnight stay and dinner. The fourth day is going to be an easy ride one as you be cycling on smooth roads and crossing some of the picturesque waterfalls and gorges. Overnight stay and dinner will be in Chungthang, a tiny town at the confluence of the Lachen and Lachung rivers. Day 05): Chungthang - Lachung (2624m/21km). Start your day with a hearty meal as today you are going to paddle uphill on the metalled road till Lachung. Till first 10 km, you will be passing through the alpine zones, dotted with numerous cascades, against the view of mountains. Dinner and overnight stay at Lachung hotel. Post breakfast, start cycling uphill by passing through rhododendron forests and meadows of primulas to reach Yumthang. In between the journey, you will come across Singba Rhododendron Sanctuary falls. Camping site of the day will be the picturesque fields of Yumthang, against the backdrop of spectacular mountains. Overnight stay in Yumthang. Day 07): Yumthang - Chungthang (1,790 m/45km downhill). Lace up your shoes and start cycling downhill to visit Chungthang. Overnight stay and dinner at Chungthang. Dig up in early morning breakfast and start cycling uphill to Lachen, which famous as the habitat of semi-nomadic Bhutia tribe. While cycling, you will come across villages inhabited by local tribes. Upon arrival in Lachen, you will be transferred to Gurudongmar Lodge for overnight stay and dinner. For initial few kilometer, you will be passing through a narrow valley and then the broad valley. Valley of Yakthang will be a sight to behold during today's cycling expedition. You will pass through trails that will be flanked by carpeted meadows dotted with wildflowers. Overnight stay and dinner at Thangu. Start cycling to Choptag Valley. Upon arrival in Choptag Valley, start cycling towards Kalapather. From her ride back to Lachen. Overnight stay in Lachen resort- Gurudongmar Lodge. After breakfast, start cycling downhill to reach Chungthang for overnight stay and dinner. Today, you will be trekking downhill to Rangrang. Upon arrival in Rangrang, you will pass by a high altitude suspension bridge to reach the campsite, on the sides of the pass fields. Overnight stay and dinner at Rangrang. After passing through paddy fields and some beautiful Bhutia and subba villages, you will reach Kabi. You will also visit the Phensong and Phodang Monasteries during the journey. Overnight stay and dinner at Kabi village. Post breakfast, embark on a drive to Bagdogra airport to catch a flight to your destination.